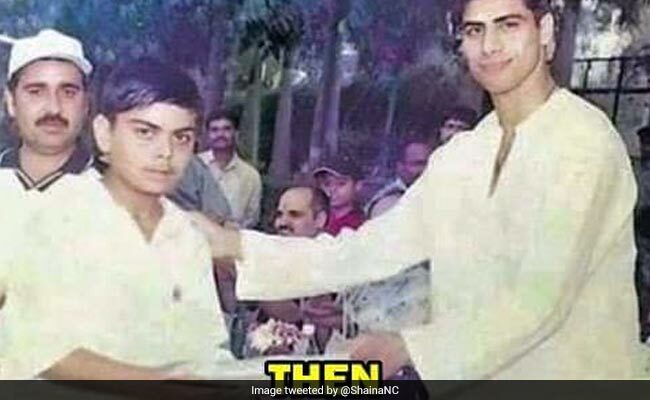 The picture shows Ashish Nehra with Virat Kohli long before he became Team India captain... or even began playing International cricket. Virat Kohli receiving an award from Ashish Nehra back in 2003. If you've spent any time on social media today, chances are you've seen several posts on cricketer Ashish Nehra. Calling time on his cricket career, the 38-year-old bowler played his last International match yesterday in Delhi. The pacer received a wonderful farewell from his team mates as well as cricket lovers all over. As social media buzzed with farewell messages for Nehra, an old picture made an expected and welcome reappearance on timelines. The picture, which will tug on any cricket lover's heartstrings, shows the bowler with none other than Virat Kohli long before he became Team India captain... or even began playing International cricket. The picture being shared by many on Twitter shows Nehra handing an award to a very young Kohli. Many on Twitter have been sharing the picture along with current photos from the farewell. Here's one of many such tweets. "That picture has become more popular because of where Virat Kohli is today," Nehra said during a press conference. "It's been a great journey," he added. Kohli too spoke about the picture. "That was back in 2003 after he had come back from the World Cup. I was 13 then and struggling for a place in the school team," said Kohli. When Nehra started his career kohli was just 11year old. Share your thoughts on this picture in the comments section below.